Jenna Henderson has found her calling. Diagnosed at 22 with kidney disease, Henderson, now 41, helps others manage their prognosis with kidney problems. A naturopathic physician since 2009, she has her own business in the Hat City, and makes time for numerous speaking engagements. She helps people from around the globe, offering holistic information to fit their specific needs. Henderson does not advocate against traditional medicine, but says there are alternatives to it. While speaking, helping others and getting the word out about kidney disease, Henderson herself is treated via a dialysis machine three times a week at the Danbury Hospital Dialysis Clinic. 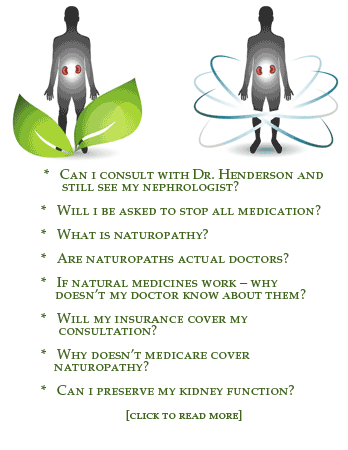 Q: What does naturopathic mean? A: We are primary care doctors who use natural therapies instead of prescription drugs. We have four years of graduate school and we have board exams to be licensed. It’s healing with the process of nature. Q: What should people know about kidney disease? A: Kidney disease is the silent killer. One out of ten Americans (more men than women) have some degree of kidney disease and early detection is the key. If you know you have a kidney problem, you should take care of it at an early stage. The No. 1 cause is diabetes and No. 2 is hypertension. Q: Tell us about your work with patients overseas? A: I find out their history. I send them a long questionnaire. I get copies of their blood work. I’ve worked with patients from Indonesia. Nigeria, Denmark, England and Canada. We talk on the telephone and Skype. I tell them how to take care of their kidneys through diet, lifestyle changes and supplements. I have 3,000 followers on my Facebook page and I also do an online radio show, “Improve Your Health,” through the Internet and I have a website. If you Google holistic and kidney, I will come up. Q: How old were you when you learned you had kidney disease and how did it change your life? A: I was 22 and it was devastating. I was pretty nonfunctional, exhausted and was putting on water weight like crazy. I was carrying 50 pounds of water weight. I went from 120 pounds to 175 pounds in a six-week period. I had no medical training at that time and I was very scared. It really cancelled my plans. I was sleeping most of the time; my life was on hold. I wasn’t sure of my career goals at the time, but everything stopped. Q: What gave you the added courage to not just accept your prognosis, but to search for other answers? A: I looked to mainstream medicine and pretty much everything that could go wrong did. There were misread and misplaced biopsies. I went to a big name New York hospital and got six months of placebo treatment. It was two years before I got actual treatment and when that did not work, they (doctors) said dialysis was inevitable. At this point, I had nothing to lose and thought I’d try alternative medicine. There is a lot of alternative medicine that is not good for kidneys. I was finding the right one through trial and error. Finding the right medicine was difficult. I finally met a doctor of traditional oriental medicine. He addressed issues that no one else did. He helped me delay my dialysis for several years. Q: In your life and through this journey, what has given you the most strength? A: I was rebellious. I was 22 when all this happened. I just wanted to do this on my own terms. I didn’t want to take 15 prescription medications, and I knew there had to be a better way.